In the center of town, the eight-acre Sonoma Plaza is a National Historic Landmark, strewn with sprawling shade trees and bordered by carefully preserved adobe buildings. Up the road in Glen Ellen, author and bohemian adventurer Jack London lived and wrote at his pristine Beauty Ranch, now an 800-acre state historic park. The Plaza makes an excellent starting and finishing point for two popular hike and bike routes. The wineries on this route reflect the evolution of Sonoma Valley. 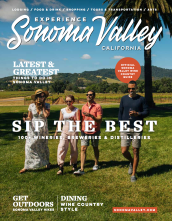 Buena Vista Winery, Sebastiani and Gundlach Bundschu represent some of the oldest wineries in California, while gems like Ravenswood and Bartholomew Park Winery are recent legends in their own right. Founded in 1823, The Mission marks the northern end of “The King’s Highway”--El Camino Real. Across the street, adobe barracks were built to house Mexican army troops during the mid 1800s. Shipped around the Horn and assembled in Sonoma in 1852, the charming gothic revival house “Lachryma Montis” (Tear of the Mountain) was inhabited by General Vallejo and his family for more than 35 years. Pick up some award-winning cheese from historic Vella Cheese Co. and farm-fresh produce at The Patch to keep your energy up! The Sonoma Overlook Trail is a pristine 3-mile walking path that winds along wooded hillsides all the way up to a lookout point that gazes out upon Sonoma Valley. A diverse array of native plants and animals can be observed along the gentle-grade trail, as well as spectacular panoramas of Sonoma Valley and the Bay Area from the meadow at the trail’s top. Docent-led hikes (see below) are available for students and adults many weekends. The trail is open to the public for walking during daylight hours. Sonoma Overlook Trail’s main trailhead lies at the entrance to the Mountain Cemetery, off 1st Street West, just four blocks north of the Plaza. The upper trailhead takes off from Toyon Road within the Mountain Cemetery. Bicycles, dogs and horses are not permitted on the trail. This 162-acre park has paved and dirt trails for hiking, bicycling and horseback riding. Picnic areas with tables and a lawn area are available at the trail head. The area features picturesque oak woodlands and beautiful wildflower displays in the spring. The park is open from sunrise to sunset year round. Parking is $7.00 per vehicle for day use. Special rates apply to buses or trucks carrying more than 9 people. Dogs are allowed but must be on a 6-foot leash at all times unless inside the dog park. Park Bring your dog to exercise, play and socialize with other dogs at the Elizabeth Perrone Dog Park. This fully fenced, 1-acre dog park is located at Sonoma Valley Regional Park off of Hwy 12. It features a double-gated entry, drinking fountain for dogs and a gazebo for shade. This park is a memorial to writer and adventurer Jack London, who resided here from 1905 until his death in 1916. The park’s stunningly beautiful acreage was once part of the legendary author’s Beauty Ranch. House of Happy Walls Museum Built by Charmian London as a memorial to her husband’s life and work. Wolf House ruins Jack and Charmian London’s rustic dream mansion was nearly complete when it tragically burned down in August 1913. Jack London’s cottage - the couple’s well-preserved main residence - is where Jack wrote his books, hosted countless guests and managed the ranch. It is also the place of his death. The Pig Palace was designed by London and built in 1915. It was laid out in a circle to save labor. The central feed house is surrounded by 17 pens. Sugarloaf Ridge State Park contains the headwaters of Sonoma Creek, and runs through gorge and canyon, across meadow floors and under scenic rocky outcroppings. The park boasts 25 miles of trails enveloped by redwoods and ferns or by oak woodland and chaparral. Deer, gray fox, the occasional bobcat and coyote can be spotted in the park. In spring, wildflowers cast a dazzling color palette across green hills. Meadow Loop: One of the best family hikes around, this loop follows the valley floor along upper Sonoma Creek. Highlights include a stop at The Ferguson Observatory and a journey down the Planet Walk. Bald Mountain Loop: The view from the 2,729 feet summit of Bald Mountain takes in everything from the Golden Gate Bridge to Mt St Helena. This hike is best during cool months or early morning. For wildflower lovers, Annadel Park offers a great variety of flowers from early spring until early summer, especially on a hike around Lake Ilsanjo. The best months to see the park’s native blooms are April and May, but some species flower as early as January or as late as September. Annadel’s highlights include thirty-five miles of trails, plus good black bass and bluegill fishing. Tucked away in the heart of the park, Lake Ilsanjo is a pleasant destination for a day hike. A favorite route to Lake Ilsanjo is via Warren Richardson Trail, a wide path whose name honors a prominent Sonoma County cattle rancher and avid horseman with a love for trails. Warren Richardson Trail traverses cool forest and open meadows on the way to the lake. To fully enjoy these routes, please be safe. Be prepared with layers and comfortable shoes. Wear sunglasses and apply sunscreen to exposed skin before going out. Dispose of your waste in appropriate receptacles. Please exercise caution—drivers may not see you. Ride bicycles on the right-hand side of trails and roads. Warn cyclists and pedestrians if you are going to pass them. We recommend you enjoy these routes during daylight. Don’t ride bicycles on them unless it’s a designated bike route.